It has been some time since Glenavon went into a derby against Portadown with a such a huge points gap in their favour. The Lurgan Blues are 19 ahead of their Mid Ulster rivals as they continue their push at the top end of the table. However, despite being well ahead of their opponents, manager Gary Hamilton sees no favourites in derby matches. 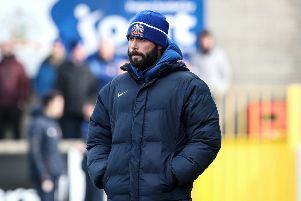 “It certainly has been a long time since Glenavon have been well ahead of Portadown on points ahead of a derby, but gaps and form go out the window because we see all over the world what can happen in these games,” said Hamilton. “It’s is all down to the day, who performs, and who has that bit of luck on their side. “We know that if we play to our strengths we can beat any team. Rarely are derby games classic games in terms of the football played. Both teams can cancel each other out, but they can be exciting games as our last few meetings with the Ports have been. “Since we last played them they have got a few good results both in the league and in the Irish Cup. “They are also a bit stronger and have added goals to the team with the arrival of Philip Lowry. Our aim is to win - even if we can win badly. It is a vital month in terms of opposition and where it might see the Lurgan Blues at the end of it. The current good run was brought to an abrupt halt by Glentoran on Monday night - a repeat of that performance will simply not bring any reward on Saturday. After beating Linfield last week, the Ports also suffered midweek woes with a defeat at Ballinamallard. Having completed his automatic one match suspension, striker Eoin Bradley returns to lead the line and his return should add the goal threat that was missing on Monday night. A big game for the Lurgan Blues in terms of keeping tabs on Cliftonville and Linfield.